Disclosure: Thank you to Little Partners for sponsoring this content. I received product in order to facilitate this review. All thoughts and opinions expressed below are my own. For more information, please refer to the disclosure that can be found at the bottom of this post. Art, in one form or another, has always been a part of my life. Growing up with a graphic designer for a mother, I was able to dabble into many different forms of artistic expression throughout my childhood. From handprint turkeys, toothpick trees, and painting birdhouses at an early age, to animating videos and using a Wacom tablet to create artwork using Photoshop in my later years. At whichever age and stage I was at in my childhood, the ability to explore and through crafts and projects of all shapes and sizes provided an invaluable outlet to express myself. When I was little, there were a few things that were at the top of my list of things I wish I had. 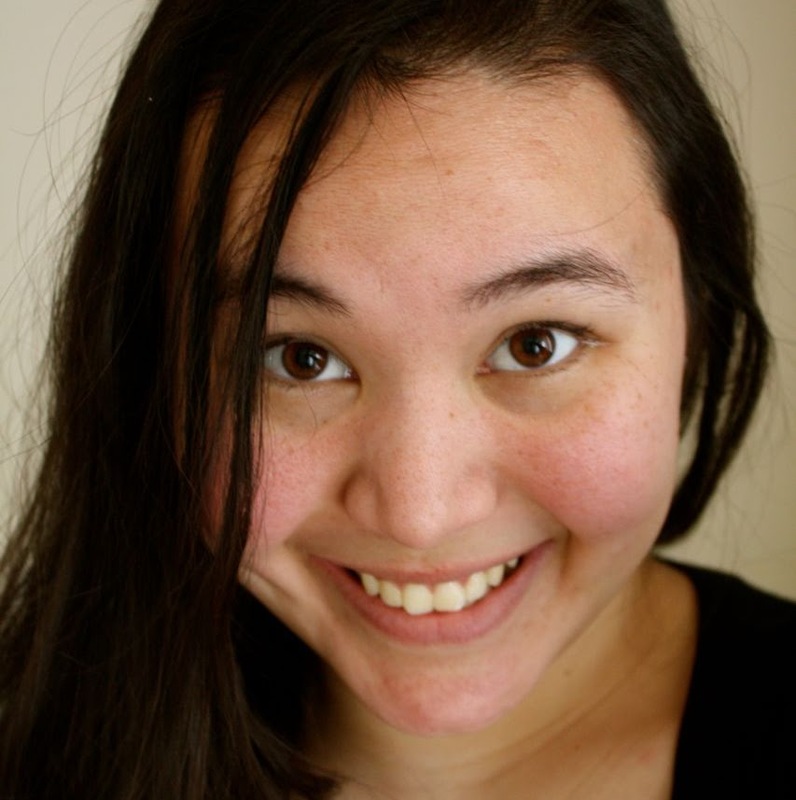 The first was a horse that I could take riding out in the country and discover new things---impossible to make a reality when living smack down in the middle of San Francisco in a one-bedroom apartment. Learning to play the piano and violin were also at the top of my list. Another one was owning a large, wooden art easel to paint acrylic and oil paints onto canvas. But alas, we didn't have enough space for that, either. Not makeup, a life-size Justin Timberlake doll, or the latest Lisa Frank school supplies. Looking back, it's not hard to see why it was something that seemed more valuable to me than any number of other things that children or teenagers want. Art is enjoyed, appreciated, and even celebrated all over the world---whether in the form of dance, poetry, clothing, architecture, pottery... and yes, painting. Little Partners is the genius company behind innovative products for children including the famous Original Learning Tower. 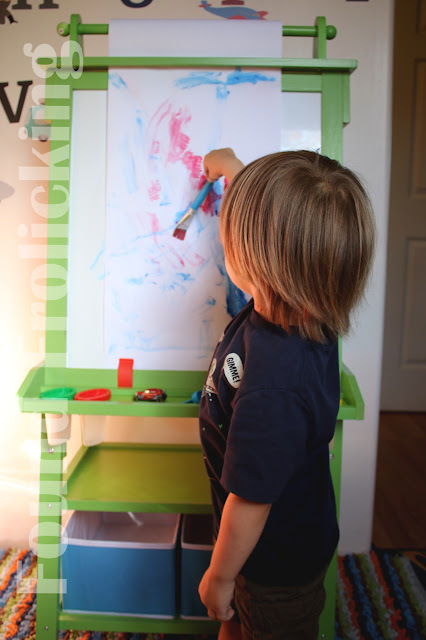 When I heard about the new Deluxe Art Center Easel from Little Partners, I had a hunch that our 3-year-old, Little E, would not only benefit from it, but also have a lot of fun using it! 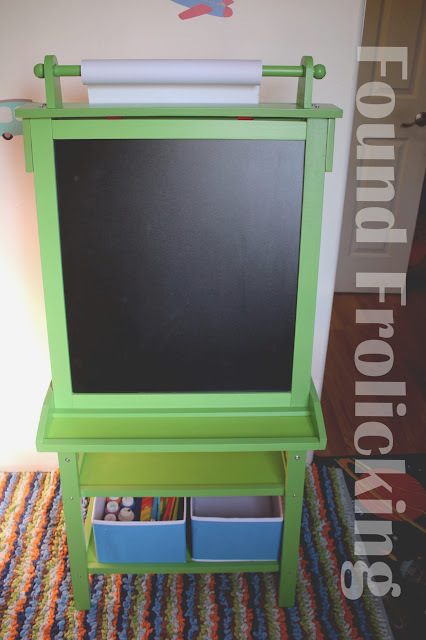 This beautiful easel is currently available in three colors---Natural, Apple Green, and Espresso. 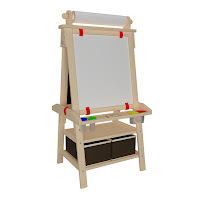 The options for your young budding artists are limitless with the Deluxe Art Center Easel, offering two storage shelves, a magnetic dry erase board, a chalkboard side offering a classic black color and a reverse side offering a vibrant blue, a parchment paper holder for painting activities and more! It was certainly love at first sight for Little E, who begged me to set it up as soon as it arrived, and asked multiple times each day for weeks on end to help him paint on his new easel. 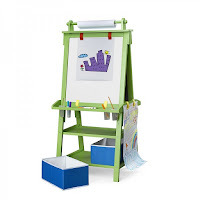 Like all Little Partners products, the Deluxe Art Center Easel is intelligently designed to be practical for families---fun, functional, and easy to clean, too! 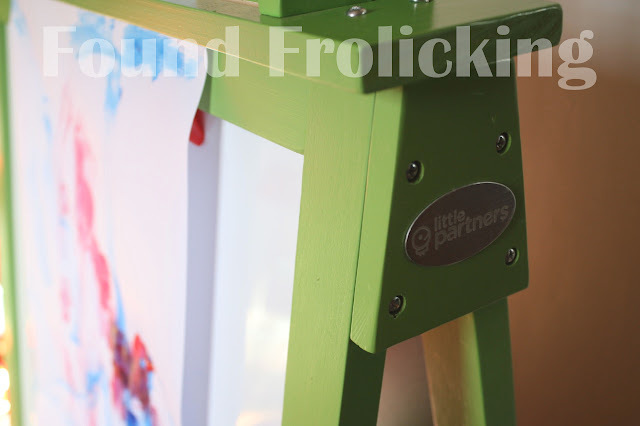 The Little Partners Deluxe Art Center Easel has made a stunning addition to my son's room with it's appealing design and cheery color. The height of the easel at full size is easily reachable and enjoyable for smaller toddlers, without being too short as to be an annoyance for older children to use. 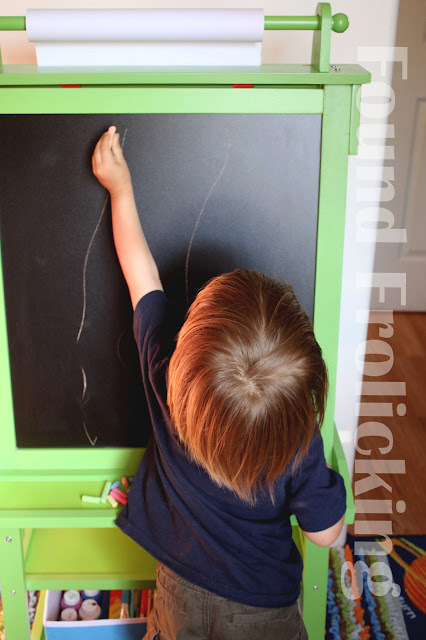 The chalkboard material is much more pleasant and easy to use than traditional chalkboard material, and I've been pleased to discover that the color of the easel holds up even after being constantly wiped down after fun toddler art sessions. This nifty little art easel has become a source of fun for our whole family, as we supervise and participate with our son in using the Deluxe Art Center Easel from Little Partners, and has become as invaluable to us as the skills it is teaching my son are sure to be also. 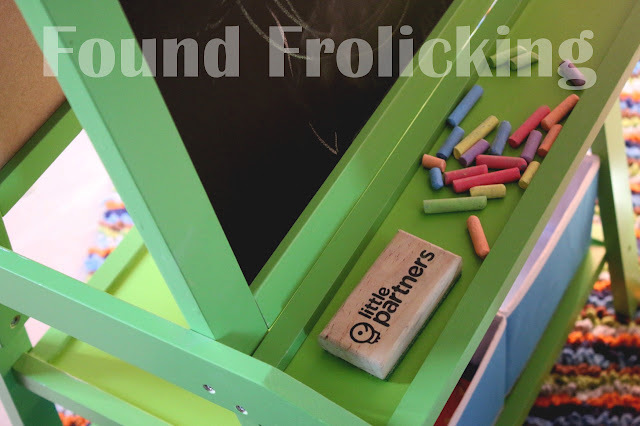 The Little Partners Deluxe Art Center Easel, showing the black chalkboard side. Little E is painting on parchment paper over the dry erase side of his Deluxe Art Center Easel using washable paint. The Deluxe Art Center Easel features many great little details, including the parchment paper holder. Handy clips at the base of the dry erase board help keep paper in place during art projects. 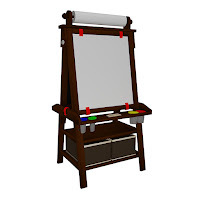 The classic A-shape of the Deluxe Art Center Easel is comfortable to use and looks great! The Deluxe Art Center Easel features a generously sized ledge for art supplies in use, and wipes clean effortlessly. 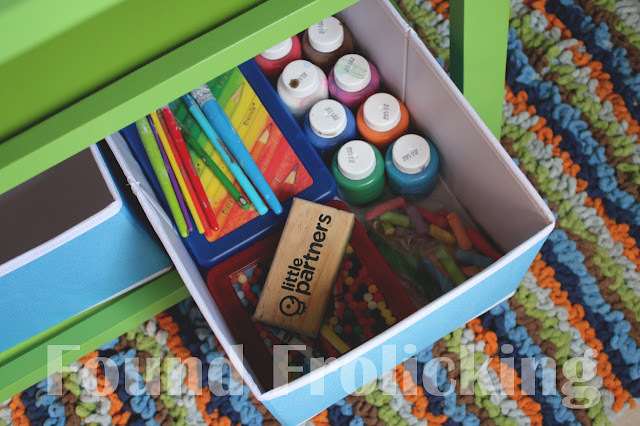 Two great wipeable storage boxes for all of your little one's art supplies comes with the Deluxe Art Center Easel. Chalkboard fun! Little E enjoys drawing to his heart's content---and erasing it when he's done, too! Another day, and another painting is complete for Little E. Thank you, Little Partners! Disclosure: This is a sponsored post. I received product to make this review possible. All opinions expressed are my own, and were in no way influenced by the brand or any other sources. The post and all photos with the watermark are the property of Found Frolicking, and should not be used or distributed in any way without first receiving permission. Found Frolicking is in no way responsible for prize shipment, but will work with the sponsors in all ways possible to ensure the winner receives their prizes. These are so cute! I think I may have to grab one for my son. I love that I need to order one of them for my children.There's a lot of storage on it. I like that it is double sided. This would have been perfect for when my boys were little. Brilliant!!! I love that you promote this at such a young age. Cultivating their creativity and artistry. That's a very nice easel. 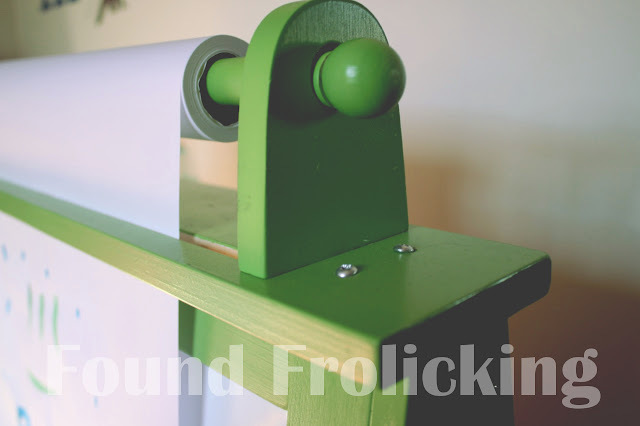 It is always best when you can store the paper right there on a roller. What a nice easel! Little E looks like he is having so much fun. That easel looks really sturdy too. I might have to look into it for my granddaughters. Thanks for sharing! How awesome is this! I could totally use two of these for the twins! It's a great activity center, especially now that we're practicing writing and reading. 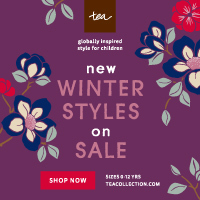 This is a very nice product, I would love to buy one for my son. He loves to draw ! I like this, sounds like a nice toy for my niece. The whole this is a great package. I like this product, very useful, it has many purpose. I think this is perfect for kids between the age of 5 and 8. 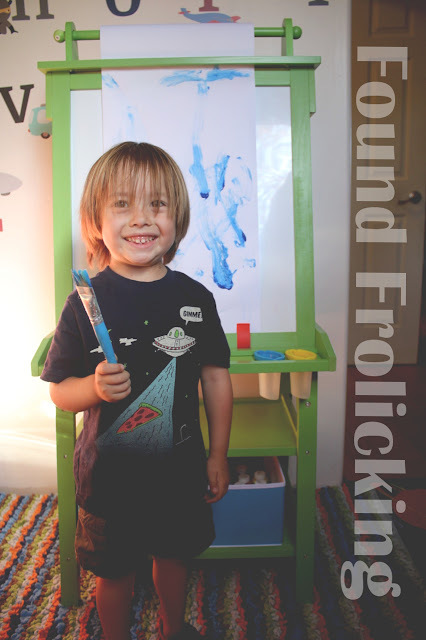 Art Easels are a great way to keep kids busy and allow them to show their creativity. Plus it helps them to learn where they can draw, paint, etc. what a great idea to save your kids art ! i would love to show them this years later! This one's amazing! The size and the extra features like the compartment make this a very wonderful gift for young ones. I always had an easel as a kid and I loved it! I still have a more grown up one to this day! My boys would absolutely love one of these! They love doing art projects! Really cute easel. I need to look into this for my sons. I love the paper feeder! Mine had to use a tablet and it kept falling off. This is way better! This is such a fun art easel! My kids would love this. They all love to draw and create and this would give them the perfect place to do it. I wanted to get something similar for my son when he was younger but I didn't. I for sure will get one for my daughter. 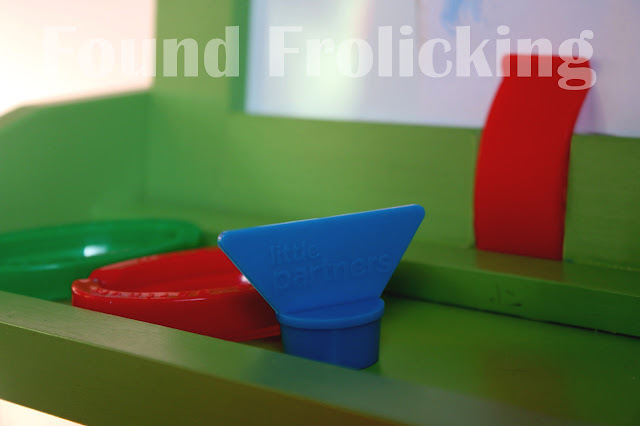 This is such a great educational tool for children. Their creativity will be enhance on this easel. Great product! It's perfect. He is so cutie by the way :) I have to check out our stores if they carry this one.